I used to read tarot quite a lot. I’d read people’s cards, or I’d cast runes for them; I also used to read crystals. I got out of the habit of it when I went to college and started to do grown-up things. Society had shown me that I was odd, and as I grew older, I became less and less accepting of it. When I was a kid and all through high school, I liked being seen as weird, as different, as other – I wanted it. College killed that in me. I just wanted to fit in. To be the girl that people wanted, not to be the girl I was, though bits and pieces of the true me underneath always leaked through. I’d like to get back into reading the tarot again, casting crystals, etc. I feel like today is a good day to do it, being the solstice, and I know I don’t have to immediately start shuffling the cards and become an instant whiz at it. I can start slow. So in that vein, I’m beginning a daily draw. 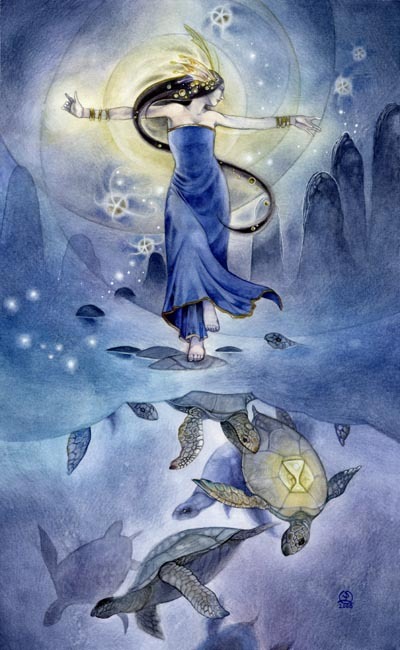 Today’s card comes from my newest deck, the Shadowscapes Tarot by Stephanie Pui-Mun Law. The very being of the Queen of Cups is a creative nexus. She is poetry in motion, imagination incarnate. She can dance upon the swells of the ever-shifting, ever-changing seas in unison with the dance of life that engages all of the world and its creatures around her. She heeds her intuitions and follows her heart. She listens to the whispers of the stars, for she knows they are much wiser than any being on this earth. They have witnessed the world from when the seas were young. Though her steps seem random and impulsive, she relies upon a deep-seated knowledge. She draws her strength from the vast abyss of the ocean. The ancients of the deeps, the sea turtles, the wise ones of the ocean: they come swimming up to join her in a joyous celebration. The world that they jointly move in is like a dream. Everything is fluid, one element melding into the next. It is the shifting landscape of the subconscious, overlapping with the material being of reality. This is the essence of creation and artistic expression. Guided by instincts, she is attuned to that otherworld, and finds joy in that communion of kindred spirits. For someone else who did not possess a comprehension of her synchronicity, a misstep from her position would mean a plunge into unfathomable depths, but not so for the Queen of Cups. She dances on, embraced by the endless azure ocean and heavens, and where the sea meets the sky, there is no seam. I think that’s a helluva welcome back to working with the tarot, and a powerful reinforcement of my creativity and spiritual presence. What a wonderful way to ring in the solstice!